A crocheted African Violet never needs watering, never dies, and is always in bloom. It's the perfect thing to brighten up your office desk, or to give as an unusual and thoughtful gift. Everyone appreciates a bit of colour, especially in the middle of winter! African Violets is an original crochet pattern by June Gilbank. 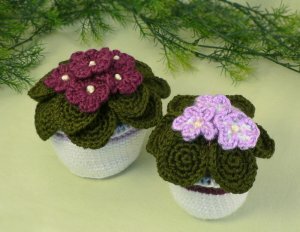 Pattern includes full instructions to mix and match your own lifesize crocheted African Violets. With two plant sizes, two pot sizes, and two flower patterns, you can create your own custom violets in your favourite shades. Date Added: 04/21/2018 by Robin N.
This pattern is well written and easy to follow with plenty of photos to help out along the way. Date Added: 06/26/2017 by Sue S.
Date Added: 09/30/2016 by Guinevere M.
Date Added: 09/21/2016 by Lynda M.
Date Added: 09/21/2016 by Nicola P.
Perfect I put in a terracota pot and it looks very effective. Date Added: 09/17/2016 by Chrisie M.
Date Added: 06/17/2016 by Melissa J. Date Added: 09/26/2013 by Aleksandra S.
Date Added: 05/08/2013 by Alicia B.